The fifth-annual Northwest eLearning Community conference will be Thursday and Friday, October 21 & 22, 2010 at Clark College’s Corporate Learning Center in centrally located Vancouver, WA. The Blackboard SafeAssign service will be down for maintenance starting at 3:00pm PDT and will be back no later than 3:00am PDT the following morning. 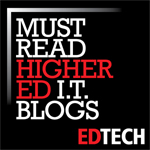 Blackboard is buying out ed tech developers Elluminate and Wimba, whose technologies are in use by more than 2,600 schools, colleges, and universities in the United States and around the world. The companies have entered into definitive agreements for the acquisition, which will cost Blackboard $116 million in cash, according to information released July 7. 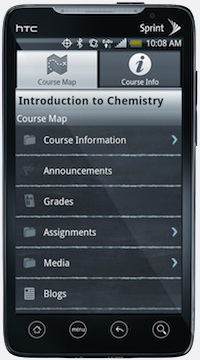 Following the release in April of Mobile Learn for Apple’s iPad, Blackboard has released the mobile version of its learning management system for Android-based phones; Apple iPhone and iPod; and BlackBerry devices. Mobile Learn is designed to mimic the full functionality of the Web-based Learn platform, including two-way communication between students and teachers, access to gradebooks, blog access and commenting, discussion board participation, and student-to-student e-mail communications. 1. Go to the blue Control Panel menu at the lower left of any page in your site. 2. Click “Customization”, which generates an expanded menu. 3. In the expanded menu click “Properties”, which opens a new “Properties” page. 4. Scroll down to the Set Availability section of the page. 5. For “Make Course Available,” click “Yes” and then “Submit.” You’re done. Sites from previous terms will automatically become unavailable to students during the second week of the new term. As previously announced, Blackboard will be down during spring break, starting Wednesday, Mar 24, at 8am. We expect to be back in operation by noon on Thursday, Mar 25. During this outage we will be reconfiguring the hardware for the blackboard servers — moving from dedicated servers located in Knight Library to virtual servers operated in Information Services. We also expect to install Blackboard 9 service pack 3, which includes a large number of bug fixes and performance improvements. There will be a power outage affecting large parts of campus this Sunday, Mar 21, from 4am until noon (depending on the particular building). Blackboard is expected to be UP and available throughout this period, but network access to it might be disrupted in some locations.